THE LORD is my Shepherd [to feed, guide, and shield me], I shall not lack. He makes me lie down in [fresh, tender] green pastures; He leads me beside the still and restful waters. He refreshes and restores my life (my self); He leads me in the paths of righteousness [uprightness and right standing with Him—not for my earning it, but] for His name’s sake. Yes, though I walk through the [deep, sunless] valley of the shadow of death, I will fear or dread no evil, for You are with me; Your rod [to protect] and Your staff [to guide], they comfort me. You prepare a table before me in the presence of my enemies, You anoint my head with oil; my [brimming] cup runs over. Surely or only goodness, mercy, and unfailing love shall follow me all the days of my life, and through the length of my days the house of the Lord [and His presence] shall be my dwelling place. I love the way the Amplified Bible expounds on the verses of Psalm 23. It clarifies so well the role of the shepherd to the sheep. Jesus said in John 10:11: I am the Good Shepherd. The Good Shepherd risks and lays down His [own] life for the sheep. The Shepherd leads, guides, feeds and shields the sheep. He watches over them all the time to make sure that every need that they have is taken care of. He leads them to areas of nourishment where they will flourish and find peace. As the Good Shepherd, Jesus Christ, restores our souls. Through His very own life that He laid down for us, He made provision for every need that we have. He continues to watch over and provide for us. We have no lack in Him. There are times when we walk through dark times, but He is always there to lead us out into the light. His very presence assures us of His love and provision. Fear has no place in us when we realize and rely on His presence. It is only as we feel that we are in this alone that fear can take up residence within us. The Shepherd’s rod was there to drive off the wild animals that would try to attack the sheep. His staff was used to pull a wayward sheep back into the fold. The anointing oil was applied to the sheep’s head so the flies couldn’t lite on their heads and get up in their nose and ears to lay eggs. 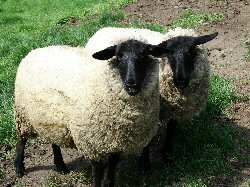 If the flies laid eggs in a sheep’s head when the eggs hatched they would crawl up into the brain and literally eat the sheep’s brain. The sheep would go crazy butting it’s head on the rocks trying to get the pain to stop. The Shepherd protected the sheep however it was needed. One of the names for Satan is Beelzebub, which means “lord of the flies”. Satan throws thoughts at people like darts that, when they have pierced the mind, bring turmoil and torment to the mental realm. It is as we are anointed with the oil of the Holy Spirit that our minds are soothed and calmed. We are responsible for renewing our mind to the Word of God so we can identify the lies of the enemy and cast those thoughts down before they have time to sink in and do their damage. The mind truly is the battlefield, but if we will allow Jesus, our Good Shepherd to give us His salvation the Holy Spirit then can anoint us and help us protect our minds. The Holy Spirit helps us understand the Word; He is our teacher and through the illuminating ministry of the Holy Spirit we grow in spiritual understanding. It protects our minds from deception as we learn to listen and rely on the Holy Spirit and His anointing. 2 Corinthians 1:21,22: Now He who establishes us with you in Christ and has anointed us is God, who also has sealed us and given us the Spirit in our hearts as a guarantee. Jesus, the Good Shepherd now sits at the right hand of the Father in Heaven, but He sent His Spirit to live within each believer. As we receive Him the Holy Spirit fills the empty places within us and seals us in Him. His anointing is like the anointing oil that the Shepherd uses to ward off the flies; it protects our minds as we yield to Him. Our Good Shepherd has made provision for our whole person; spirit, soul and body. We are His; evidenced by the Holy Spirit within. 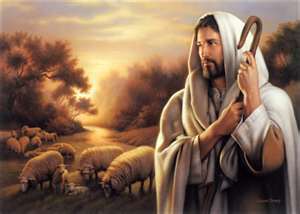 Father, I thank you for Jesus, our Good Shepherd. I thank You for sending Him to die for us; to give us new life as we give our hearts to Him. And Father, I thank You for Your Spirit that has come to live in us as we yield our lives to You. Father, fill us to overflowing today with Your Spirit that we might experience Your presence, Your power and Your anointing. I pray for my friends this morning, Father, that You would visit them in the power of Your Spirit, lifting them to new places in You, Lord. Give them revelation knowledge of Who You are and want to be in them. Show them, Father, that it is only in You that they experience life and that more abundantly. Help them to overcome by yielding to Your love, faith, hope and peace. Give them joy unspeakable and full of glory as they pray and yield to You. Thank You, Father, for touching the sick with Your healing hand, for providing for those who are experiencing lack and for visiting the lonely with Your love and presence. They need You, Lord, for only in You can we find provision for our needs. Thank You, Father. I pray these things in Jesus’ name. Amen.